National guitars have a special magic to them. Artists have deemed them worthy of album covers (Dire Straits “Brothers in Arms”) and lyrics (Paul Simon “Graceland”). They instantly evoke a sense of grassroots American blues and folk with their loud shimmering tone and metallic attack. National guitars are a name that came out of the late 1920’s and are synonymous with the metal-bodied resonator. Guitar Village is proud to be one of the few UK dealers for National guitars. The work that goes into creating these beautiful instruments, from the handmade bodies and necks to the intricate and painstaking engraving, means these don’t just fall off a production line but are meticulously crafted with immense skill. Ordering one from their factory in California can mean a long wait but you always know what arrives will be of the highest quality. Our Guitar of the Month, the National Style 1 Don, is a limited edition recreation of a highly sought after 1934 model that, at the time, was the most decorative and expensive National had ever made. 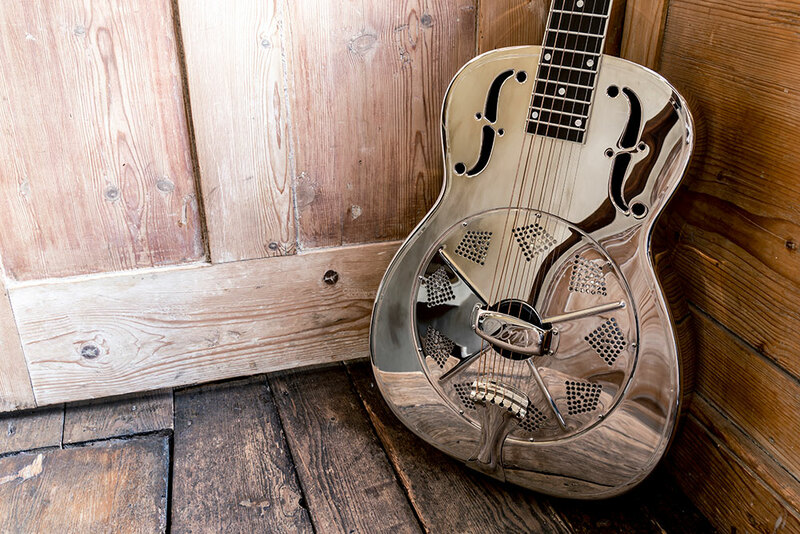 The authentic Nickel Silver body (also known as German Silver) is bright and loud as a resonator should be yet without the harsh tinniness you get with cheaper materials. The maple “biscuit” bridge – so called because of the wooden disc that holds the saddle – and hand-spun 9.5″ cone transmit the sound into the body like an amp speaker. The overall sound is smooth and silky, perfect for fingerstyle slide playing. Other features include a Honduras mahogany neck, bound ebony fingerboard, pearloid overlaid slotted headstock, bone nut, and “DON” engraved bridge cover.